Although the extremely ancient Octave of Pentecost, dating back to the 4th century, survived the 1956 reforms, the decision to abolish it had already been made by Pius XII’s Commission in February 1950. (1) In fact, from 1948, when the Liturgical Commission put forward a proposal to “courageously abolish the Octave,” (2) its days were numbered, in more ways than one. It was, therefore, always a “racing certainty” that this would be accomplished, if not under Pius XII, then at the first available opportunity. 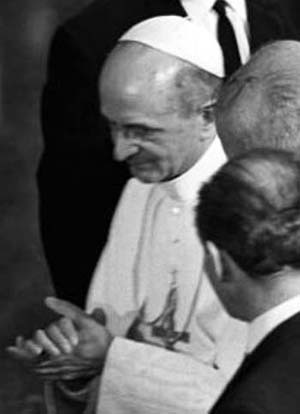 The Octave was given a stay of execution until 1969, when Paul VI erased it completely in order to accommodate the Novus Ordo “Ordinary Time,” which starts immediately after Pentecost Sunday. There was, thus, no time for fond farewells or lingering leave-taking of this mighty Feast that was pivotal for the whole Liturgical Year, no time to savour its message or meditate on the Third Person of the Holy Trinity in Whose honor the Octave was instituted. Having been deprived both of its Vigil and Octave, the Feast of Pentecost was suddenly reduced to an ordinary Sunday. It was turned into a stand-alone Feast and made to look like a one-day wonder, after which the liturgy was unceremoniously hustled from Red to Green and disconnected from the theme of Pentecost. 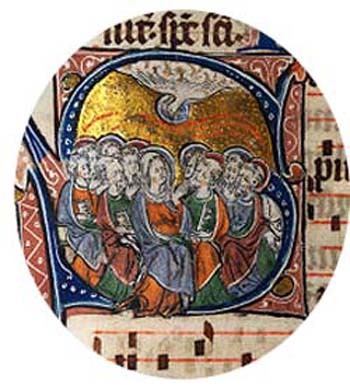 As with the Vigil of Pentecost, the Octave had also been closely connected with that of Easter. Both shared the distinction – unique in the Tridentine Calendar – of being classified as Octaves of the first rank. Great would have been his surprise had he lived to see the abolition of the Octave, not to mention the Vigil, of Pentecost whose liturgy had entitled it to parity of esteem with the Easter celebrations. Let us consider the astounding artistry and aesthetic beauty of this part of our spiritual patrimony, which Bugnini had been planning to destroy from 1948. 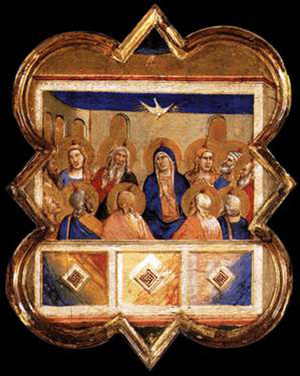 Closing the window of the "Golden Sequence"
At each Mass the Veni Sancte Spiritus with its Alleluia was sung or recited to reinforce the “outpouring of the Holy Ghost” at Pentecost. Formerly known as the “Golden Sequence,” it was widely appreciated as a masterpiece of liturgical poetry, yet its flowing rhythms, its clarity and simplicity made it appeal to the masses. What distinguished these Ember Days from all the others in the Liturgical Year was their position within a season of jubilation, which made them a bitter-sweet time, partaking of both fasting and feasting. What exactly were these “notions of their own”? A brief examination of the rationale for the abolition of the Pentecost Octave will show that it was carried out in flagrant repudiation of the principles of liturgical development. For, as we shall see, Bugnini failed to apply any standards of rational evaluation of the existing tradition. But, the premise is logically irrelevant to the conclusion, having no bearing whatsoever on whether the Octave should be abolished. Besides, there is simply not enough solid evidence about the liturgical practices of the first centuries to state with certainty that there were never any days of extended festivities after Pentecost. (10) And even if there were not, it would not entitle the reformers to wipe out over 1600 years of ancient and universal tradition and throw the Octave of Pentecost into the flames. Incredibly, this 50-day-and-no-more argument (11) was enshrined in the 1969 Calendar by the Congregation of Rites and signed by its Secretary, the future Cardinal Antonelli. But, the reason given in that document for the abolition was spurious, being based on words purportedly written by St. Athanasius that the 50 days were celebrated “as one feast day, indeed as one ‘great Sunday.’” (12) But it can be easily verified that St. Athanasius did not write the words attributed to him in the quote. (13) Absurdly, the Bishop of Alexandria is now regarded as the champion of an Octave-less Pentecost, even though he never opposed the concept of an extended Feast. Not only was the Pentecost Octave not a diminution of Easter, but it was eminently fitting as a vehicle of greater honor to the Holy Spirit, which was the entire purpose of the Pentecost celebrations. How could the same Spirit be pleased with the abolition of a liturgy that owed its inspiration to Himself ad majorem Gloria Dei? 3. They claimed that the Octave contained a self-contradictory feature: fasting and feasting in a week of joyous celebration. The whole basis of this reform was fundamentally flawed. Memoria, Supplement II, 1950, p. 23, n. 76. Of the 3 “experts” consulted by the Commission, Dom Capelle stated that the Octave should be retained, but he was outnumbered by Frs. Jungmann and Righetti who voted to abolish it. The same source reveals that this was exactly the same 2:1 outcome for the proposal to abolish the Octave of the Ascension and replace it with a pre-Pentecost Novena. Interestingly, Capelle stated that “no sufficient reason” was given for this change, and that it was “unheard of in any liturgical rites.” (“Sufficiens ratio non datur cur traditionalis octava mutetur in Novenam, quod inauditum est in usibus liturgicis”). “Rinunciare corragiosamente all’octava”, Memoria, 1948, §79, p. 79. A. Bugnini, The Reform of the Liturgy, p. 307, n. 9; p. 319, n. 38. Bugnini had already planned this strategy in 1950. See Note 1. Sunday: Fear of the Lord; Monday: Godliness (Piety); Tuesday: Knowledge; Wednesday: Fortitude; Thursday: Counsel; Friday: Understanding; Saturday: Wisdom. Dom Guéranger explains the logic of the order: the first five gifts are the graces needed for the active life of the faithful in the world; the rest relate to the contemplative life and our mystical union with Christ. Mgr. Pierre Jounel, whom Bugnini appointed to the Consilium, stated that they wanted to scrap Ash Wednesday and have Lent begin on its first Sunday. See ‘L'Organisation de l'année liturgique,’ La Maison-Dieu, 100 (1969), pp. 147-148. L. Bouyer, Mémoires, Paris, Editions du Cerf, 2014, pp.199-200. Fr. Bouyer did not mention any names, but the Editor of the Mémoires (Note 29, pp. 303-304) conjectured that at least one of them was Mgr. Pierre Jounel who was in charge of the Temporal Cycle of the Calendar. A. Bugnini, The Reform of the Liturgy, p. 319. 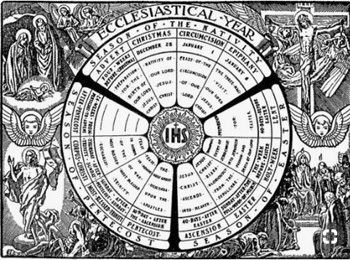 General Norms of the Liturgical Calendar, 1969, (§ 22, n. 12, Athanasius, Epistula festalis 1). Memoria, 1948, §79, p. 79. Pope Leo I, Sermon 78, On the Whitsuntide Fast, I.